Bro. Eli, Presiding Minister to the Members Church of God International (MCGI), opposed the proposition of Mr. Eusebio of the Church of Christ. According to Mr. Eusebio, it was Christ who established and owned the Church. Eusebio’s Church of Christ is not to be confused with the Iglesia ni Cristo sect founded by Felix Manalo. Eusebio’s is a religious organization based in Negros Oriental, a province in Central Visayas. Since the live religious debate’s heyday in the country circa 90s, the public and MCGI brethren have not seen a Filipino spiritual figure challenge Bro. Eli until the February 7 event. Hence, anticipation was fever-pitch high, opening an outpouring of status messages in various social networking sites like Facebook, Twitter and Instagram a week ahead of the schedule. The enthusiasm for the occasion shown on the social web peaked as the official Twitter account @AngDatingDaanTV announced the event’s official hashtag Friday morning, eight hours before the debate proper. 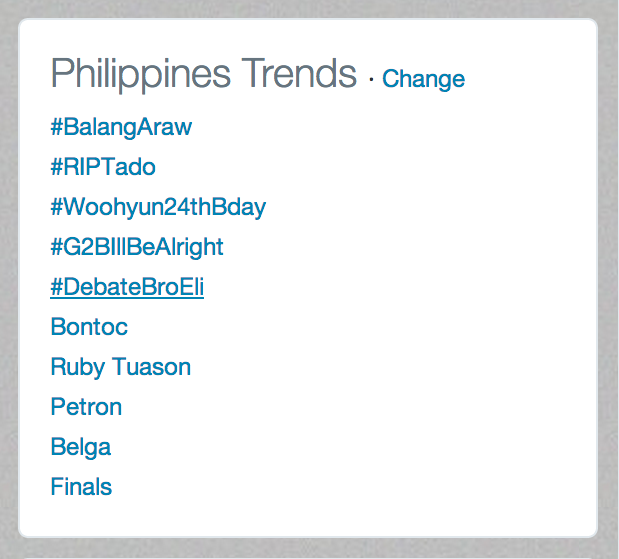 Grace Cortez tweeted, shortly after the announcement of the official hashtag, that she was “Excited for tonight’s event #DebateBroEli”. The hashtag also enabled users to invite people to witness the formal debate that has not been seen for the past few years. “The debate will be happening later. You are all invited to come at 6:30 [in the evening] in any Ang Dating Daan Coordinating Center. #DebateBroEli,” posted Leonardo Calma. Furthermore, the innovative way of categorizing tweets accordingly allowed the online community to share their sentiments as the occasion happened. In a tweet, Sarah Aguilar shared how she felt as Bro. 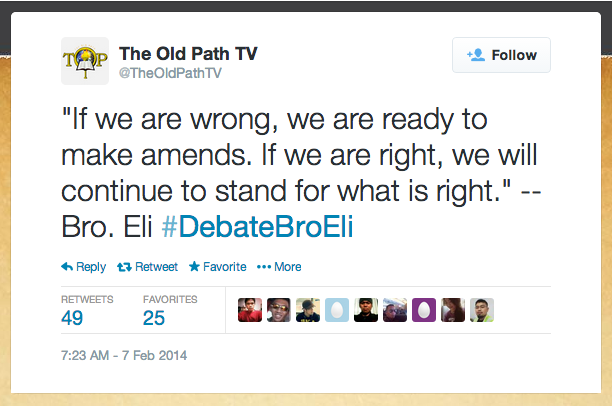 Eli cited verses to support his stand, “It’s amazing how even in one verse of the Bible that Bro. Eli Soriano reads, one will find this inexplicable outburst of wisdom”. 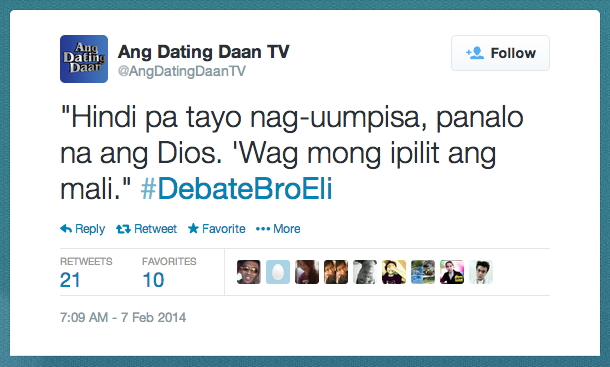 With the Twitter accounts of @AngDatingDaanTV, @TheOldPathTV and @MCGIdotorg on the lead, the #DebateBroEli was ultimately utilized to post Bro. Eli’s and Mr. Eusebio’s arguments as the debate took place. More than being a platform to post real-time updates about the debate, Twitter and Facebook were avenues helpful in propagating Bible-based wisdom and principles. On the online community, the most shared posts were the faithfully exclaimed words of Bro. Eli Soriano along with the hashtag. “The intent of this debate is not to show that one had lost or one was defeated and the other triumphed. Because triumph belongs to God, glory belongs to God,” the undisputed debater further remarked. Both parties were thankful for the opportune time to defend each other’s stand. According to Mr. Eusebio, he will continue studying what Bro. Eli is preaching. 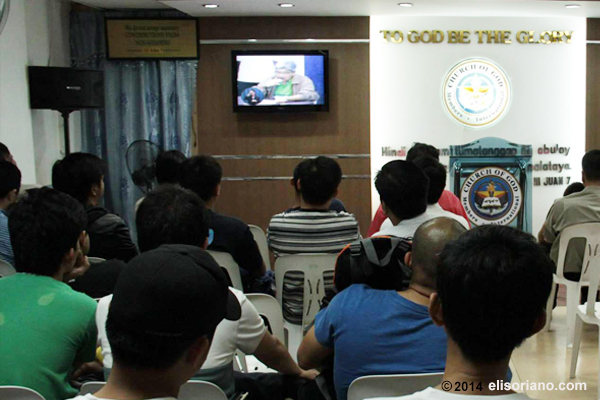 Apart from the attendees accommodated by the 1,281 monitoring stations worldwide and the Ang Dating Daan mobile-based coordinating center, the virtual world were able to witness the phenomenal debate involving Bro. 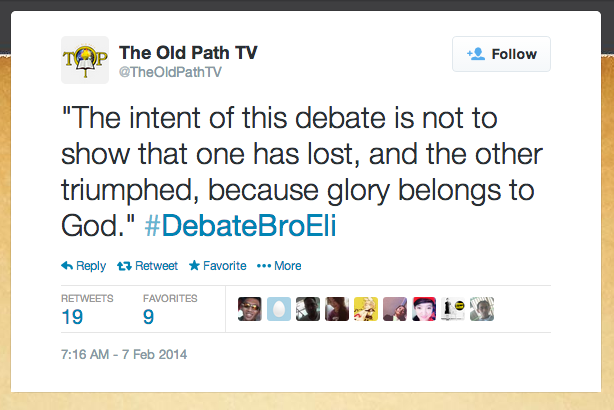 Eli and to learn biblical truths through the hashtag, #DebateBroEli.